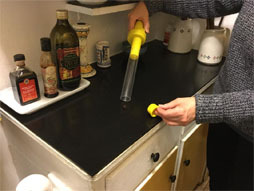 $12.25 BugBuster Insect Vacuum captures bugs, spiders, insects, moths and even stink bugs safely at arm’s length. Reusable, simple to use, long lasting and effective. Ideal for anyone who cannot stand the thought of killing, squishing or touching live insects and bugs. Its powerful suction draws the insect into the plastic tube. Close tube with removable cap. Take the No-Kill BugBuster outside and relocate the insect where it is needed to maintain the balance of nature. Measures 15 inches in length and operates on a single 9V battery (not included). Made by Sonic Technology.